For the background select a large piece of watercolor paper bigger than your actual memory page size. Use the white crayon to draw in a design, being sure to press hard. With the other three crayons draw directly on top of the white design. Use the #10 brush to apply water over the crayon using vertical strokes. Let this dry and then trim to your memory page size. On another piece of watercolor paper, pencil in a bathtub shape using the sketch pencil. This can be simple or ornate but be sure to leave an open space to write in. Outline the bathtub shape with the fine point end of the Blue Brush Marker. With a wet #2 paintbrush gently drag the color away from the line. Cut out the tub shape. Write your personal bathtub memory inside the tub shape using the Blue Sketch Pen and adhere it to the background paper near the bottom. Select two or three photos (they have to be bathtub scenes!) Crop your photos into circular shapes. Add a little variety by using different sizes. Using the colored paper, cut slightly larger circles to frame the photos. Attach them together with photosafe adhesive. On a small piece of white watercolor paper letter in the words "Rub A Dub Dub - Look Who's in the Tub" using the Blue Sketch Pen. 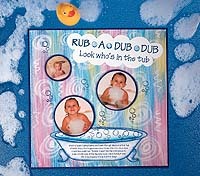 Leave space between each word in "Rub A Dub Dub" to add bubbles. Use the side of the foam tip of the Blue Brush Marker to gently brush color only on the top bubble of the "Bubble Stream" and stamp between the words. Color in the bubbles with the Light Blue Crayon. Cut the paper into a fun soapsuds shape and adhere to the top of the background paper, slightly off-center. Use the "Bubble Stream" stamp again and brush on color using the Blue Brush Marker. Stamp directly onto the background in the open spaces. Glue the background sheet onto a slightly larger colored paper to give it a nice border.